DSSI uses a dichroic beamsplitter to simultaneously image in two filters using two 512x512 CCDs with plate scales of 0.011 arcsec/pixel. DSSI images are reconstructed from sets of 1000 exposures of 60 msec each. Typically a 256x256 subarray is read out, yielding a 2.8 arcsecond field of view. For extended targets one may (more slowly) read out the full 512x512 CCD for a 5.6 arcsecond field of view, although this incurs additional overheads. Under good conditions it is possible to achieve diffraction-limited resolution (0.016" FWHM at 500nm and 0.025" at 800nm) using the 256 subarray. The longer readout time when using the full array will reduce the best resolution to ~0.025" (500nm) and ~0.028" (800nm). The filters have widths of 10-60nm and are selected as a pair that will operate on opposite sides of the wavelength intervals selected by one of the two available dichroic beamsplitters. The current filter set for DSSI is listed in Table 1 with names that are indicative of the most comparable, but broader, Johnson-Cousins filters. Table 2 gives the approximate wavelength channels for the dichroics. 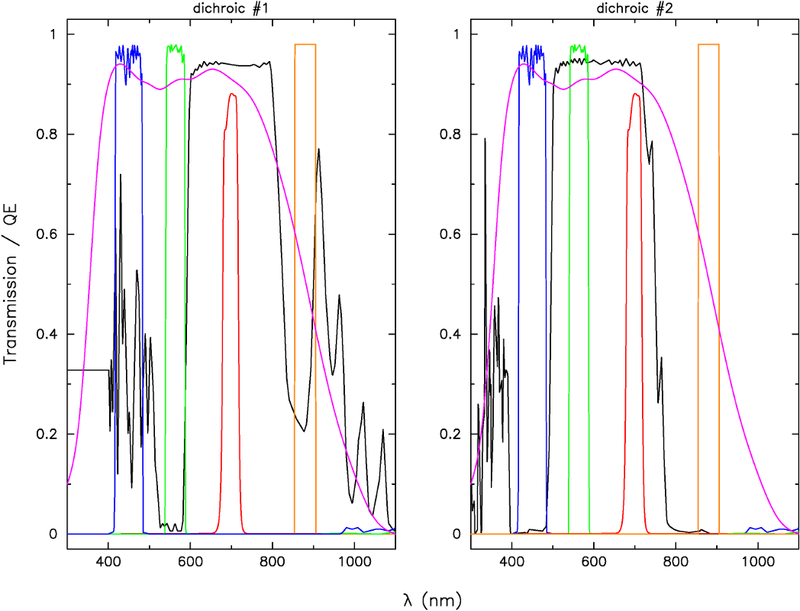 The filter and dichroic transimission curves and EMCCD QE are also shown in Figure 1. Available filter pairs are B+V, B+R, V+R, V+I and R+I. It is also possible for proposers to supply their own filters within the constraints dictated by the instrument and telescope scheduling. Note that the filters are fixed in the instrument, and filter changes must be made manually, so changes during the night are not supported. The filters are 25mm diameter round interference filters, mounted in a threaded frame as used in many commercial applications. The current DSSI filter set was produced by Edmund Optics. The cost per filter is ~ $140 US dollars. Table 1. Available DSSI filters. Imaging is done simultaneously in either B+V, B+R, V+R, V+I or R+I. Table 2.Ideal operating wavelengths for the DSSI dichroic beamsplitters. Figure 1. The filter transmission profiles (B = blue, V = green, R = red, I = orange), the dichroic transmission profiles (black), and the CCD QE (purple).